1. Preheat the oven to 200°C, gas mark 6. Place the aubergine slices in a small roasting tin in a single layer and drizzle with a tablespoon of the oil. Season then roast in the oven for 45-50 minutes until charred and golden. 2. Meanwhile, heat some of the remaining oil in a flameproof casserole and brown the lamb on all sides. Remove with a slotted spoon. Add a splash of the white wine to the pan and scrape away all the brown bits on the base of the pan. Add the remaining oil, onion and garlic to the pan and cook for 5 minutes until soft and golden. Stir in the cumin and cook for 1 minute. 3. Return the lamb to the pan with any juices and add the tomatoes, remaining wine and seasoning. Bring to the boil then cover and place in the oven for 45 minutes. 4. 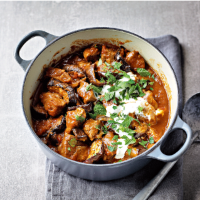 Stir the roasted aubergine slices into the lamb and return to the oven uncovered for a further 15 minutes until the lamb is tender and cooked through. Stir the soured cream and chopped mint together then stir into the lamb but don’t mix in completely – you want a marbled effect. Check the seasoning and serve with jacket potatoes or bread to mop up the juices.